I have one delicious treat to share with you today. 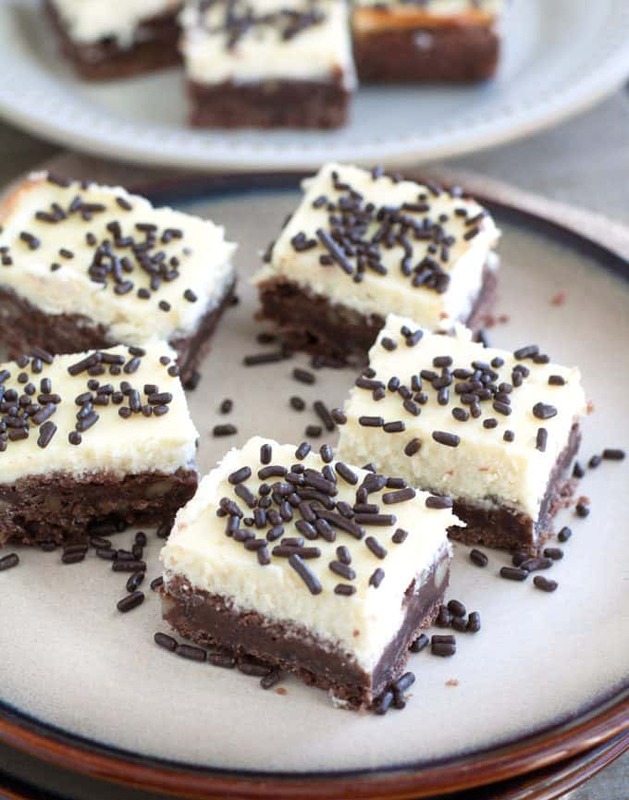 Rich, creamy cheesecake squares with a chocolate walnut crust. These things are so good, I could not wait to finish with my photos so I could take a big bite! Cheesecake is one of those classic desserts that you can find on almost any restaurant menu. When my husband and I are out on the town, it is one of his go-to desserts. With three small kids, date nights don’t happen as much as we would like and sometimes we have to improvise. I’ve started “Fancy Friday’s” where I make a nicer dinner for us to enjoy once the kids go to bed. Guess what my husband requests for dessert? 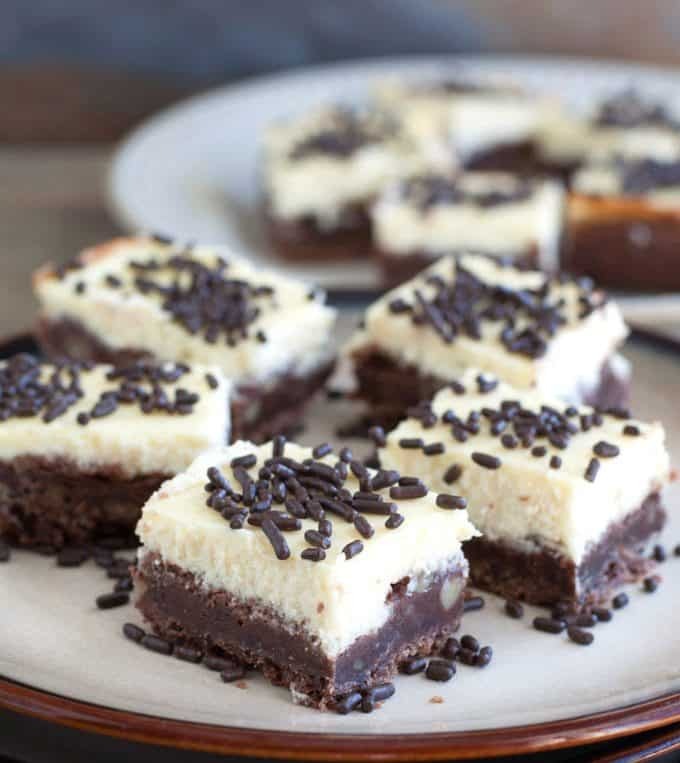 Cheesecake squares! 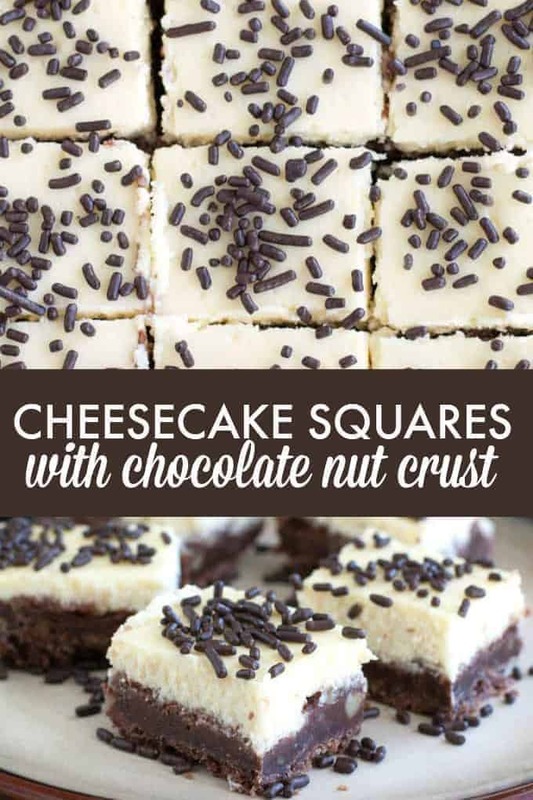 The thing that makes these bites a little different is the chocolate, walnut crust. It adds a rich, chocolate taste with the complement of nutty flavor and texture. This crust would also be delicious paired with pumpkin cheesecake. 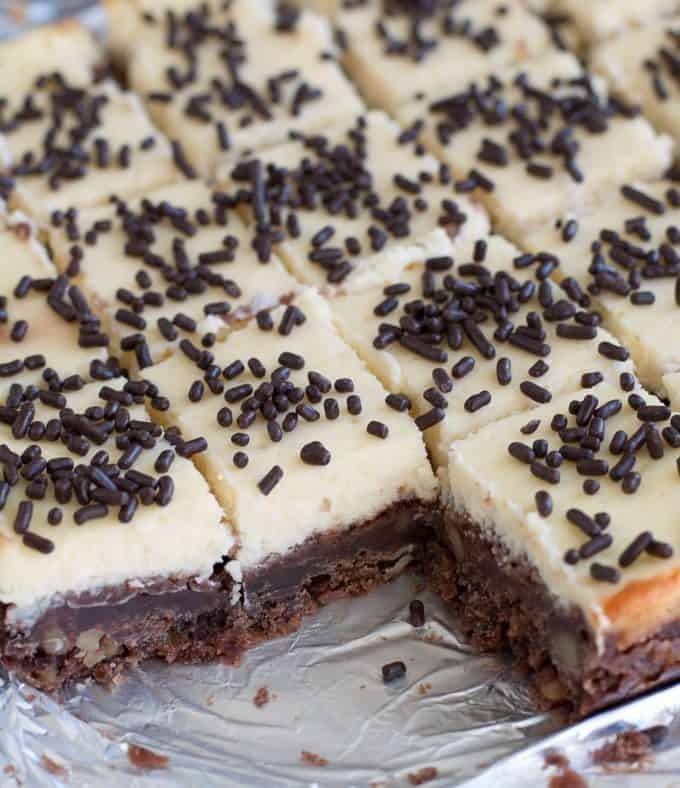 Here are a few helpful tips to achieve perfect cheesecake squares with chocolate crust. Before you start mixing the cheesecake filling, make sure the cream cheese is very soft. I recommend leaving it out on the counter for at least one hour. This helps the cheesecake come out smooth. Next, line the baking dish with foil so that you can easily lift out the cheesecake after it has chilled. This makes it SO much easier to cut the perfect bite. Make sure to chill the cheesecake in the refrigerator for at least six hours before cutting. I usually make them in the evening and then chill overnight. 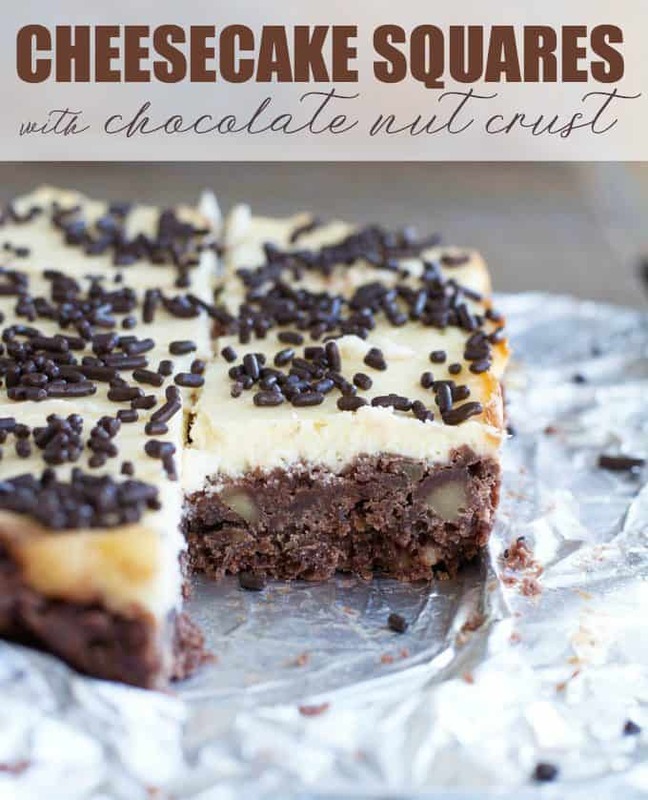 The first step in making the cheesecake squares is making the chocolate walnut crust. Combine flour, sugar, cocoa, baking powder and salt. Next cut in cold butter. I like to use a biscuit cutter to chop up the butter in with the flour mixture. Stir in egg yolk, vanilla and chopped walnuts. I recommend finely chopping the walnuts into very small pieces. Press the mixture into your foil lined baking dish and bake for 15 minutes. To make the filling, beat the softened cream cheese with sugar until smooth. Add sour cream, flour, eggs and vanilla. Pour over crust and bake for another 20-25 minutes. Make sure to cool the cheesecake completely before refrigerating. I topped mine with chocolate sprinkles. 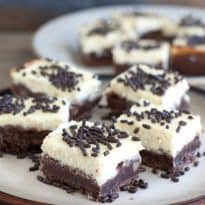 If you love cheesecake, be sure to check out these Eggnog Cheesecake Bars and for more simple and tasty recipes, visit me at Food Lovin’ Family. Enjoy! Are you a cheesecake fan? 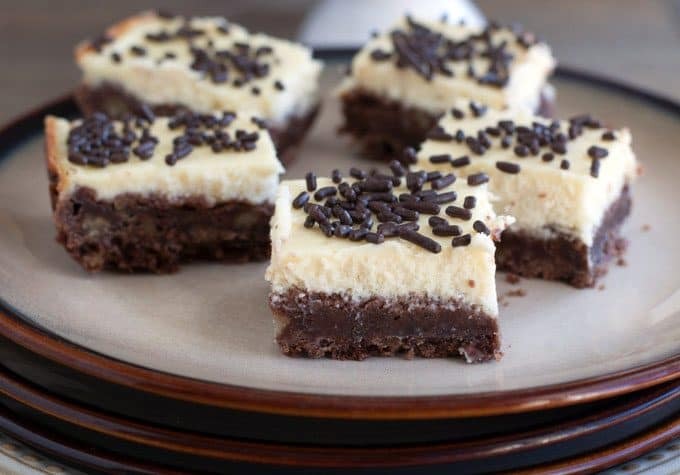 Rich, creamy cheesecake squares with a chocolate walnut crust. One bite and you’ll be in cheesecake heaven! Line a 9-inch baking pan with foil. Spray foil with non-stick cooking spray. In a small bowl combine flour, sugar, cocoa, baking powder and salt. Cut in the butter until the mixture makes fine crumbs. Mix in egg yolk, vanilla and chopped walnuts. Stir until well combined. Press the mixture onto the bottom of baking pan. Bake crust for 15 minutes. Beat cream cheese and sugar in a mixing bowl. Mix until smooth. Add sour cream, flour and salt. Mix in eggs and vanilla and beat on low speed until combined. Pour cheesecake mixture over crust and bake for 20-25 minutes. Cool on wire rack for 1 hour. 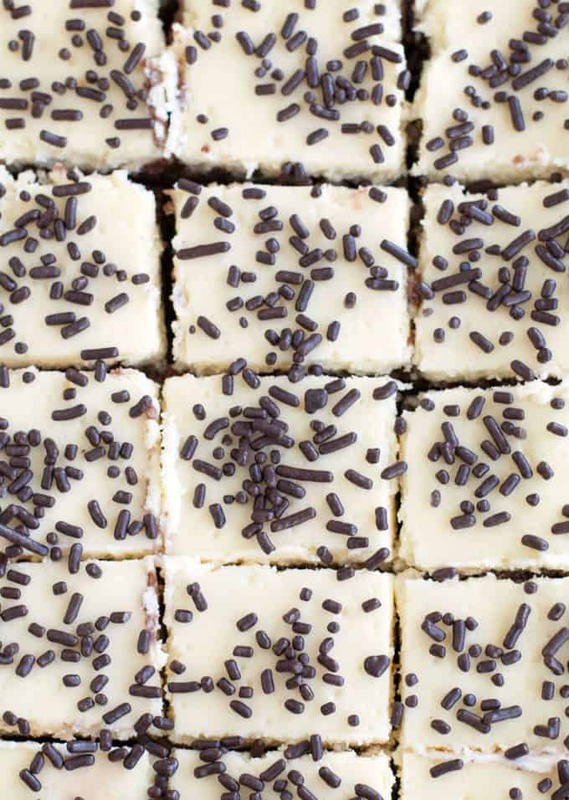 Optional: Top with chocolate sprinkles. Lift foil out of pan and cut into squares to serve. Heather lives just outside of Atlanta, Georgia with her husband and three young children. She blogs over at Food Lovin' Family where she creates and shares family friendly recipes, crafts and the occasional party. I’m not a baker, but would love to taste these! YUM! These would be perfect for Valentne’s Day!! This looks so delicious and easy to make! I want to make this dessert for the family. These look and sound really good, will have to make them the next time we want a little treat. This looks amazing, but i’m not a cheesecake lover. My mom is though! I bet they taste as good as they look. Thanks. Very tempting ! Definitely will do ! Thank you and have pleasant weekend ! Am I the only one who doesn’t see the walnuts listed in the ingredients? I’d like to know the amount. These bars sound really delicious. Totally saving this recipe. I love having nuts in a crust, adds a lot of flavour. I like these. They look so delicious. This looks like a nice treat to make and share with co-workers at work. Thanks for this recipe.We will be making these over the week end. How many walnuts are needed for the crust? Thanks for catching that! It’s 1/2 cup of chopped walnuts. We’ve updated the post. You had me drooling over at the BFF link party, I had to come get the recipe!! They look utterly DELICIOUS!!!! Thanks for helping me fix my sweet tooth!! Lol!! It is the best of two worlds in one wow. So happy to see it in the Meet Up Monday party. Looks fantastic. Thanks so much for sharing your delicious Cheesecake Squares with us at Full Plate Thursday. Hope you have a great week and come back to see us real soon! Such a yummy looking recipe. It combines all the best things. OK – I’m running for the kitchen! I love cheesecake a pan of these wouldn’t last long in my home!